Yes, it's been a bit busy around here. If you haven't heard, the annual Salmonfly hatch is kicking off on several locations in SW Montana. 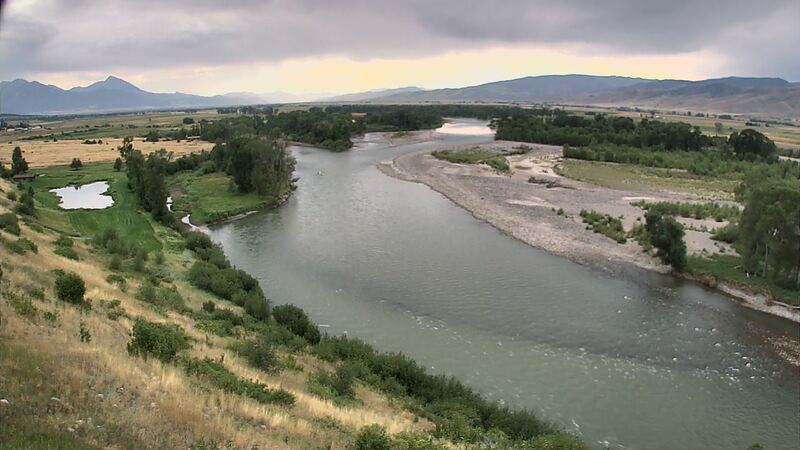 The Yellowstone River being one of them. As such, the place is hopping. We're a bit ahead of schedule, but that hasn't kept folks from getting out there by any means. The river is in great condition having gone from unfishable brown and high to perfect shape in very quick order. We're guessing that a lot of folks may be thinking the river isn't quite ready yet. Or that the salmonflies would hold back. Not the case. We get folks asking to tell them when the "Hatch is On" for the Yellowstone. This is your call- better get here. Hunter Greene showing us how it's done right with guide Jeremy Brown. One of several really nice browns caught and released here in the valley! Going subsurface? Try: Pat's Rubberlegs in multitude of colors and sizes- Black sz 4-10, Brown sz 6-12, Peacock sz 6-10; Tungsten 20-incher sz 8-12; Brett's Goldenstone sz 8-12; Marabou Rubberlegs Camo sz 6-8; Mercer's Poxyback Stone sz 10-12; King Prince sz 12-16; Iron Sally sz 12-16; Morrish Super Pupa olive and amber sz 12-16; Bh FB PT sz 12-16; Mercer's Psycho Prince in orange or dirty pink sz 12-16; Kyle's Yellow Sally BH sz 12-14; Bloom's Tung Dart sz 14-16; BH Copper Softy Olive sz 14-16; Translucent Pupa in Olive or Brown sz 12-16; Delekta's Hammerhead Hare's Ear, Holo Green sz 14; Lil Spanker PT sz 12-16; Big Spanker TB purple, PT sz 14. Looking for that tug on a streamer? Try: RL Crystal Buggers black sz 8; LE Wooly Bugger Black or Olive sz 8; Coffee's Sparkle Minnow smoke, olive, or sculpin colors All Sizes; El Sculpito, AW Bugger, Rusty's Horn; Goldfinger; Urchin Bugger in black or olive; Sculpzilla; Danny Boy Sculpin; Articulated Fathead in black or olive; Barr's Slumpbuster; Bow River Bugger Olive. Fly shop is open 7 days a week from 7:30 AM till 6:00 PM. Be sure to swing by for the best flies, gear, and info in the Valley!